Section 23 of the Land Drainage Act (1991) prohibits the construction of certain kinds of obstructions in ordinary watercourses without the prior consent of the regulating body concerned. Work that is carried out without consent has the potential to increase flood risk to people and property and can result in civil action being taken. Please note that work cannot be retrospectively consented. What type of work requires consent? Establish a new culvert within an ordinary watercourses. When considering if your works require consent, check if they would affect the flow of the watercourse when it is full to the top of the bank. If the flow of the watercourse, when it is full to the top of the bank, will be affected, then the work will likely need consent. If you are in any doubt about whether you require consent, contact the relevant City or District Council who are undertaking the consenting on behalf of Oxfordshire County Council. Even if you have planning permission, or other consents, you may still require consent if you intend to carry out works on a watercourse. A culvert is a covered channel or pipe which prevents the obstruction of a watercourse or drainage path by an artificial construction. A culvert has a maximum capacity, which depends on its size, slope, roughness, and its entrance and exit design. A flow larger than the capacity will not be able to pass through the culvert, and at that time the culvert will have affected the flow, diverting it elsewhere with possible flood risk consequences. Schedule 2 paragraph 32 (2) of the Flood and Water Management Act (2010) amends Section 23 of the Land drainage Act to require that any new culvert must have consent of the regulating body before it can be constructed. Ordinary watercourses include streams, drains and ditches and culverts/pipes through which water flows and that do not form part of a main river (see below for main river consents) or sewers. This includes watercourses that may be dry for part of the year. If you are planning on undertaking any work affecting an ordinary watercourses, you may require consent from Oxfordshire County Council who are the regulating body. However, it has been agreed that the City and District Councils will undertake this work on our behalf under an agency agreement. Where an ordinary watercourse falls within the relevant City and District Council boundaries they will be responsible for consenting, with the exception of the Cherwell District Council area, which will be undertaken by West Oxfordshire District Council. 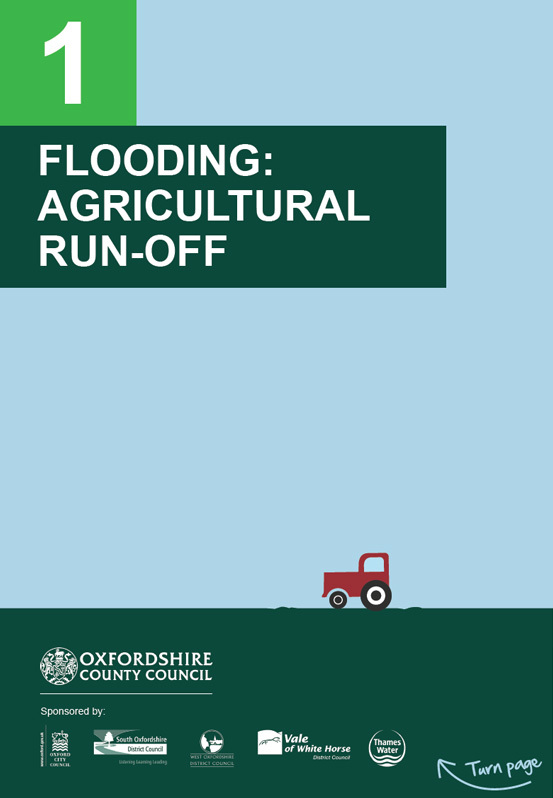 We recommend you contact the relevant City or District Council, or West Oxfordshire District Council in the Cherwell area, as early as possible for advice to determine whether your proposals will be deemed to affect the flow of an ordinary watercourse and therefore require consent. We can also advise on what to include with your application, other organisations that you may need to consult on your proposal, and how long it is likely to take us to determine your application. When all the preliminary details have been agreed we will ask you to fill in a Land Drainage Consent Application Form that can be obtained from the relevant City or District Council. Please note that there is a fee of £50 per structure (e.g. headwall, pipe, chamber etc.) on each application but there is no charge for enquiries. The level of fees will be determined by the council based on the information you provide. The Environment Agency regulates watercourses that have been designated as main rivers; these can be viewed on our Flood Risk Map page. 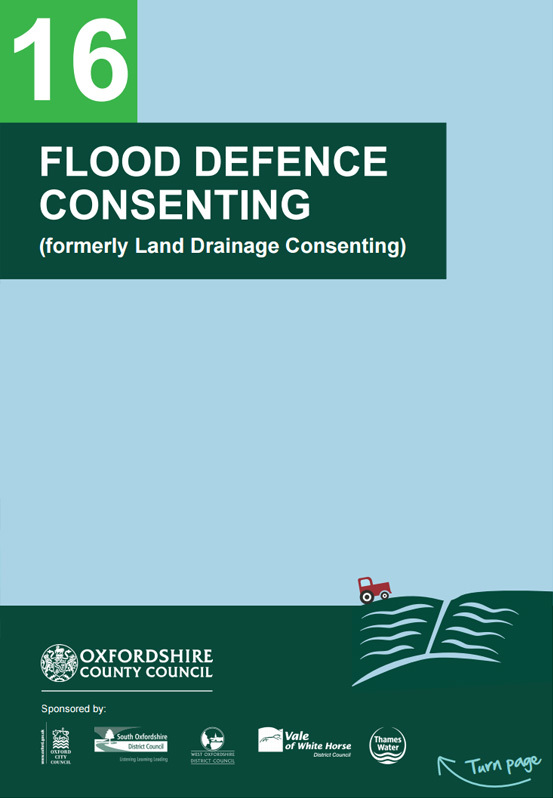 Visit the Environment Agency’s consent page to apply for consent for works on a main river or phone 03708 506 506. Under the provisions of the Land Drainage Act 1991, as amended by the Flood and Water Management Act 2010, Oxfordshire County Council, as the Lead Local Flood Authority, has a duty to regulate certain activities that might have an adverse impact on flood risk and the environment and to ensure that riparian owners carry out their responsibilities. This duty applies to ordinary watercourses. 1. The issuing of consents for any changes to a watercourse that might obstruct/alter the flow. The consenting process is in place to ensure that any works carried out in or near a watercourse do not have a negative effect on nearby properties or the environment. It also ensures that any works which may affect flood risk are properly designed. 2. Taking enforcement action to rectify any unlawful and potentially damaging work to a watercourse. 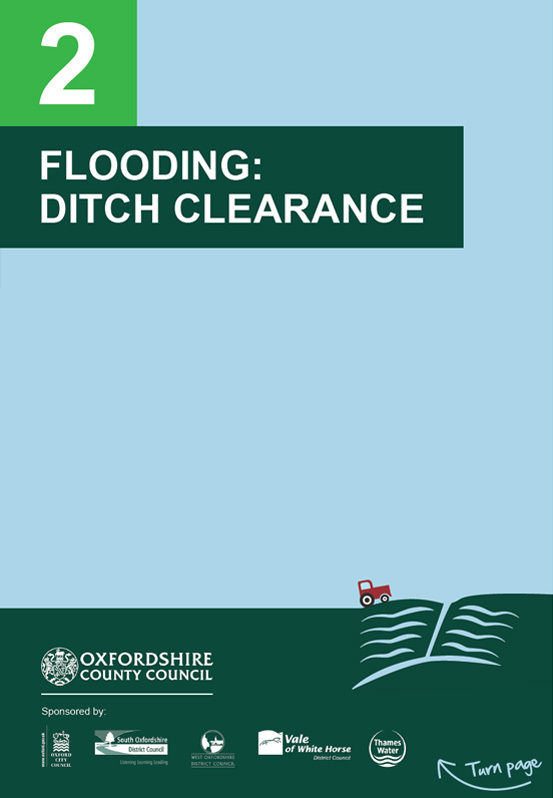 In exceptional circumstances, enforcement action may be required where activities on an ordinary watercourse have caused adverse effects on flooding and the local environment. This will depend on the severity of the obstruction and/or the level of risk associated to the stretch of watercourse. 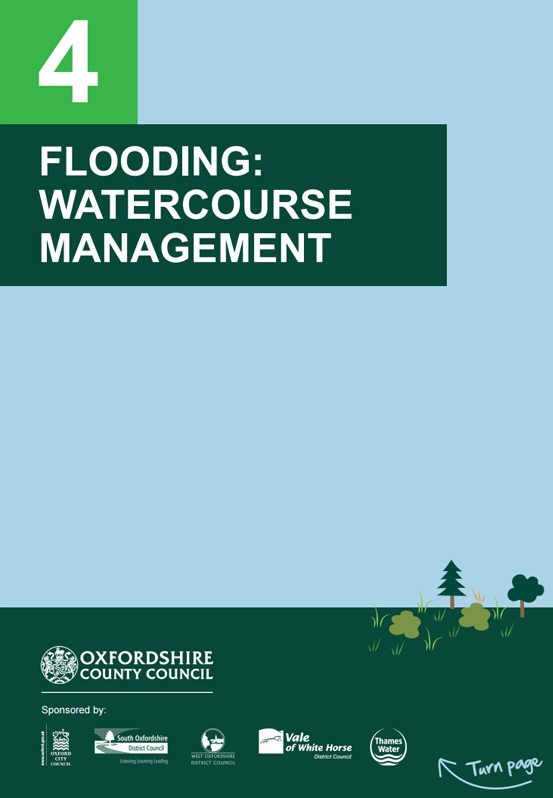 Oxfordshire County Council have powers under the Flood and Water Management Act (2010), with regard to the issuing of consents, to enforce against un-consented works and general enforcement of riparian owner duties on ordinary watercourses. These powers are permissive, meaning that we may choose to intervene in the public interest where we believe works would be beneficial and/or economically viable, but we are under no legal obligation to do so. Ensure the proper flow of water in a watercourse and over the floodplain. To control water levels and the security of existing assets. When do we use these powers? If a watercourse or feature is in need of maintenance, we encourage the person that owns it, known as the riparian owner, to take remedial action. If a riparian owner fails to carry out this maintenance on a watercourse or feature we can use our powers to serve notice requiring them to undertake the necessary works. Failure to comply with such a notice may result in us undertaking the work and recharging the owner with the costs. Who else has powers of enforcement? 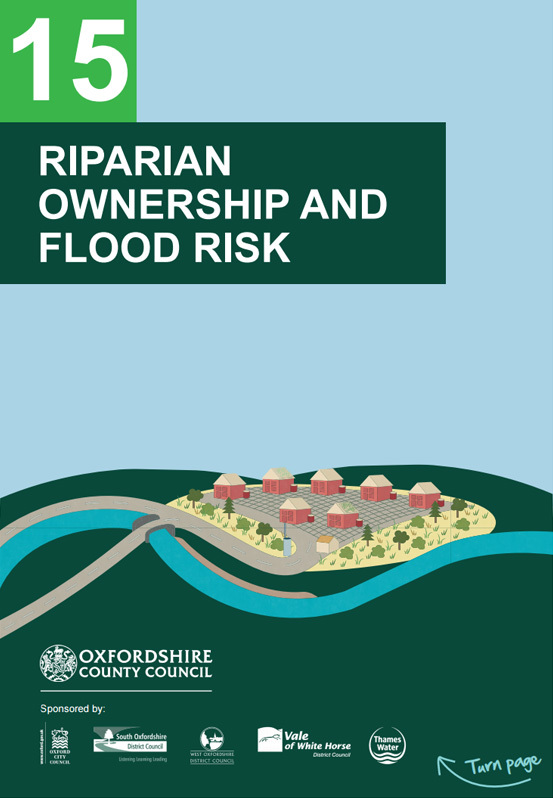 The Environment Agency also has permissive powers under the Water Resources Act (1991) to undertake works in main rivers and regulate the activities of riparian owners. As the Highways Authority, Oxfordshire County Council has powers under the Highways Act (1980) to ensure the public highway is effectively drained. Thames Water has some powers under the Water Industry Act (1991) to ensure their assets are performing and do not pose a threat to flooding. District Councils also have permissive powers to enforce certain types of regulation relating to flood and water management under the Land Drainage Act (1991), Public Health Act (1936), Environmental Protection Act (1990) and Localism Act (2011). The Education section will be opened on an external site (the Northamptonshire Flood Toolkit), in a separate tab/window. The Flood Aware Schools Pack was created by Northamptonshire County Council, but is applicable to any school and teacher across the country. As such, please do utilise these tools.